Home Fiber and Textile Arts A very unusual sampler Has anyone seen anything like this? I found a very Curious sampler and I wonder if anyone has encountered anything like it. 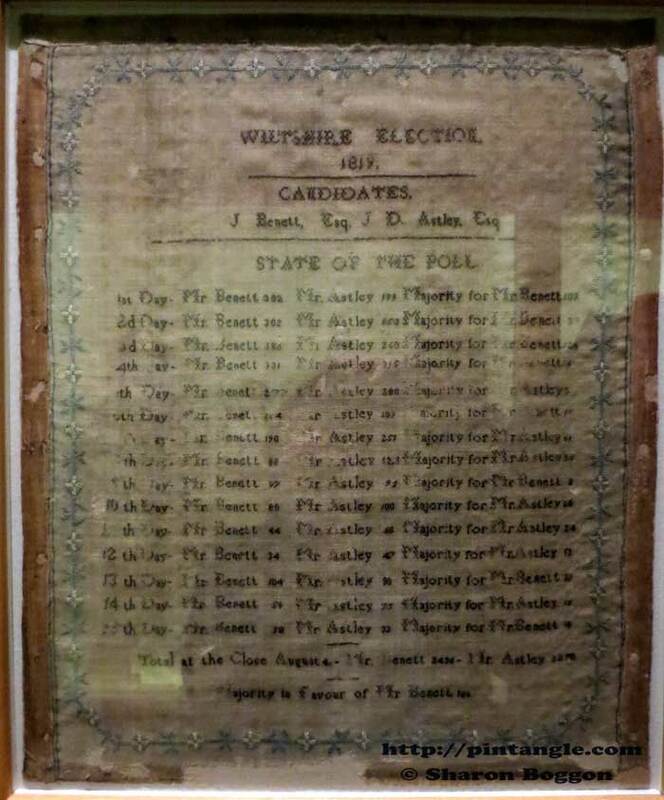 In the Salisbury Museum which has some great lace samples, some stumpwork, costume and accessories one of the items that caught my attention was a Sampler that recorded the results of the Wiltshire election of 1819. Has anyone ever seen anything like this? Click on the image to see a larger view. It was behind glass in a room that was not well lit and this is best photo I could do. As you can see each candidates name is recorded and the number of votes. The piece was works in cross stitch on what looks like linen. There was no accompanying information and it has really sparked my curiosity as I cant remember seeing a sampler that recorded political results quite like this. If any of my readers know more about his or samplers like it please let me know. Maybe they wanted to practice their lettering and really like the candidate? hi Sharon….what is your definition of the word “sampler”? I tend to use it as a piece (like your big long one) that displays “samples” of different stitches or different techniques. Ginger in this case the museum used the term in the description of the object. It was hung on a wall between a band sampler from about the 17th cent and pictorial sampler from about the 18th Cent.